In January, 2017, I went to the Monica Steinberg presentation, in conjunction with the “Holy Barbarians: Beat Culture on the West Coast” exhibition at the Menil, and because I was concerned about parking, I rode my Vespa to the program. When it was over at 8 pm, I walked over to the parking lot, and as I was approaching my scooter, I noticed a woman (short and older) standing next to it, bent over, examining it intently. And as I walked up to her I impulsively asked, “Want to go for a ride?” As soon as I said it, she straightened up, lit up like a Christmas tree and said, “Could I?! !” I said, “Sure!” So, I got helmets out, helped her get on (she had a bad hip), and took her for a ride around the museum block and back to the parking lot. She had gone to college at the University of St. Thomas in the 1960s. 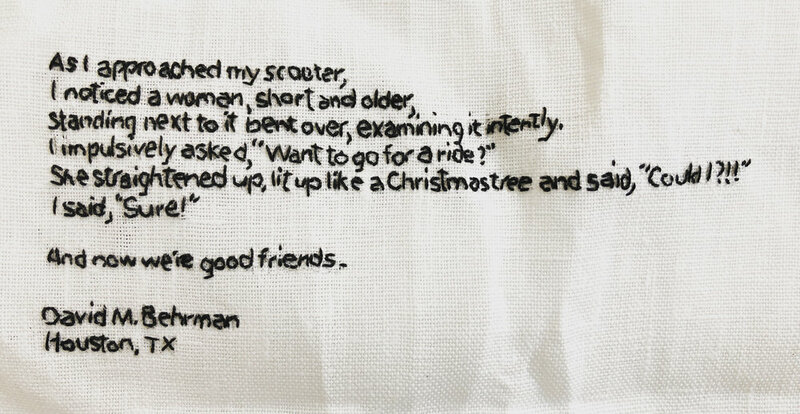 And the reason she was so fixated on the Vespa was that she had a friend at the university who used to take her for rides when they were in college, and that experience is one she’s cherished for years. She was so excited, and we talked for a while after the program, about art and Monica’s presentation. She knows a lot about art and is articulate in her observations. And I was so taken with her courage in the parking lot – taking a ride in the dark with a stranger on a Vespa! – that I tracked her down, emailed her, and a few weeks later we met at the Menil and went to another program together. And now we’re good friends. "The Accident". Phillip Walsh. Houston, TX.